Leave your contact details and our manager will contact you to confirm orders. Thank you for your order. Soon our manager will contact you to confirm the order. Transparent oily liquid of yellowish color. The product has a contact insecticidal and repellent effect. Cyfluthrin belongs to the group of synthetic pyrethroids of the second type, which disrupt the sodium channels of ectoparasitic nerve cells, which leads to a delay in membrane repolarization, inhibition of nerve impulses, impaired coordination of movements, paralysis and insect death. After application, a small amount of the drug is absorbed and ensures its long insect-acaricidal and repellent effect. The drug is low-toxic for warm-blooded animals and in recommended doses does not give a resorptive-toxic and irritating effect. 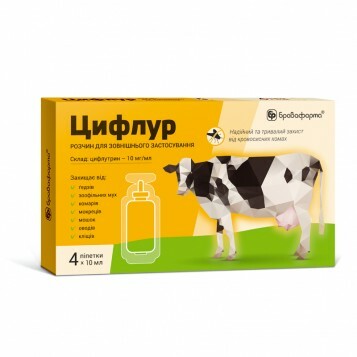 It is indicated for the protection of cattle in the pasture period and dogs during the activity of ectoparasites: zoophilic flies Haematobia stimulans, Lyperosia irritans, L. titilans, Stomoxys calcitrans, Musca autumnalis, M. larvipara, M. amica etc., blood-sucking mosquitoes Aedes, Anopheles, Culex, black flies Boophthora, Simulium, Schaenbaueria, biting midges Culicoides, Forcipomya, Zentocononops, gadflies Chrysops, Haematopota, Tabanus, botflies Нypoderma bovis, H. lineatum, horn flies, ixodic ticks, fleas Ctenocephalides canis, lice Linognathus setotus, louse Trichodectes canis etc. Do not administer to calves with body weight less than 100 kg, the puppies until two months of age, female dogs in the first half of pregnancy. • cattle — 5 ml per 1 animal up to 300 kg of body weight and 10 ml per 1 animal over 300 kg of body weight. The product is applied along the spine from the withers to rump at ambient temperature not higher than 25 °C. Within 3 hours after treatment, the animals must avoid contact with water. Dairy cows are treated immediately after the evening milking. The best protective effect is achieved when all livestock is treated simultaneously in spring on pasture, and the following re-treatments every 4-6 weeks. • dogs — 1 ml per 10 kg of body weight, applied and rubbed into the skin on shoulder area, in the period of active ectoparasites. Repeat no earlier than 4 weeks after the previous application. The staff contacting with the product must observe the general rules of hygiene and safety adopted for work with veterinary drugs. The treatment of animals should be carried out in overalls (bathrobe, hat, rubber boots, hygiene gloves). After finishing work, wash your hands with warm water and soap. In case of accidental contact with the drug on the skin, mucous membranes or eyes, they should be rinsed with plenty of water. Meat and milk are used without restrictions, upon condition of use in recommended doses. Polymer pipettes of 10 ml (4 pcs in a box), polymer vials of 500 ml with dispenser of 10 ml. Store in the original package in a dry, well-ventilated place, protected from direct sunlight, inaccessible to children and animals, away from food and animal feed at a temperature from +8 °C to +25 °C. After opening of a vial, it should be tightly closed and used within 2 months.